In recent decades, we have all heard how stress affects us. But most people make the connection to their peace of mind, or may go so far as to feel that stress is ‘bad’ for their heart health or perhaps mental health. What most of us don’t know, until making the Stress and the Disease Connection, is that stress is primarily governed by our adrenal glands, and if they aren’t functioning optimally, every bodily system will suffer the adverse effects. Join stress experts Dr. Karen Jensen ND and Dr. Marita Schauch ND as they outline all the environmental, societal, and systemic ways our bodies deal with stress every day, and learn how to combat stress naturally, for a better, healthier, and more disease-free you. Adrenal fatigue is a very common and quickly growing problem of modern life. The stressors we are faced with on a daily basis all contribute to stress on the adrenal glands. People suffering from adrenal fatigue are much more likely to develop various other common diseases ranging from diabetes to cancer, heart disease and more. In The Adrenal Stress Connection Dr. Karen Jensen, ND and Dr. Marita Schauch, BSc, ND, explore how healthy adrenal glands prevent chronic disease and allow us to maintain energy and vitality even during stressful times. The Adrenal Stress Connection is available at most health food stores across Canada and online through Amazon and Indigo. Making Sense of Women’s Health is a comprehensive guide for women of all ages. It offers information on complementary therapies such as lifestyle and diet, vitamin supplementation, and herbs to help women make informed choices about their specific health concerns. 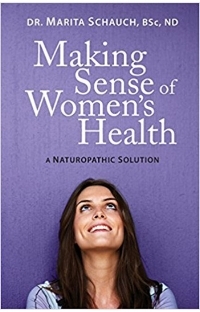 Making Sense of Women’s Health is available at most health food stores across Canada and online at Amazon and Indigo.